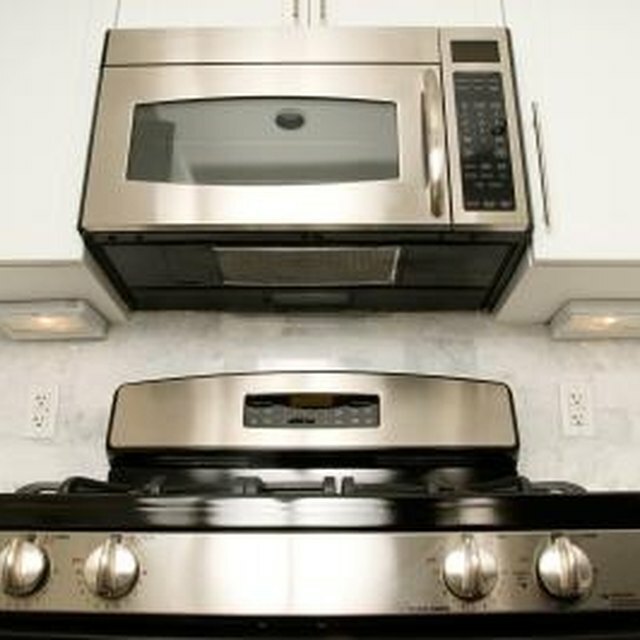 The GE Spacemaker JVM240 is a residential appliance that combines a range hood and a microwave oven. This particular model is designed for installation above the stove, allowing you to save space on your kitchen counters. The underside of the GE Spacemaker JVM240 has a vent that takes advantage of a charcoal filter, which filters smoke and grease from the air during cooking. When making repairs to the GE Spacemaker JVM240, it sometimes is necessary to take the appliance down from the cabinets. Removing the microwave is a straightforward process, but should never be attempted alone. Place a towel or blanket on a sturdy surface that is large enough to hold the microwave. This is the location you will place the microwave after it is removed. Unplug the microwave from the wall outlet. Often, the microwave is plugged into an outlet hidden in the cabinets above the appliance. Position an assistant below the microwave to brace it and ensure it doesn't fall. Remove the four mounting bolts from the upper cabinet that secure the microwave in place using a Phillips screwdriver. Tilt the microwave down, then pull the power cord through the hole in the underside of the cabinet so it is free. Lift up the rear of the microwave, off the rear mounting bracket, and move it away from the wall. Place the microwave on the sturdy surface. Microwaves are capable of carrying a charge even after they are unplugged. Never attempt to disassemble a microwave.